New Zealand runner Nikki Hamblin was lying on the track, dazed after a heavy fall and with her hopes of an Olympic medal over. Suddenly, there was a hand on her shoulder and a voice in her ear: "Get up. We have to finish this." "I was like, "Yup, yup, you're right, this is the Olympics Games. We have to finish this,'" Hamblin said. Hamblin fell heavily on her right shoulder, D'Agostino got up, but Hamblin was just lying there. She appeared to be crying. Instead of running in pursuit of the others, D'Agostino crouched down, put her hands under the New Zealander's shoulders to help her up, and softly urged her not to quit. 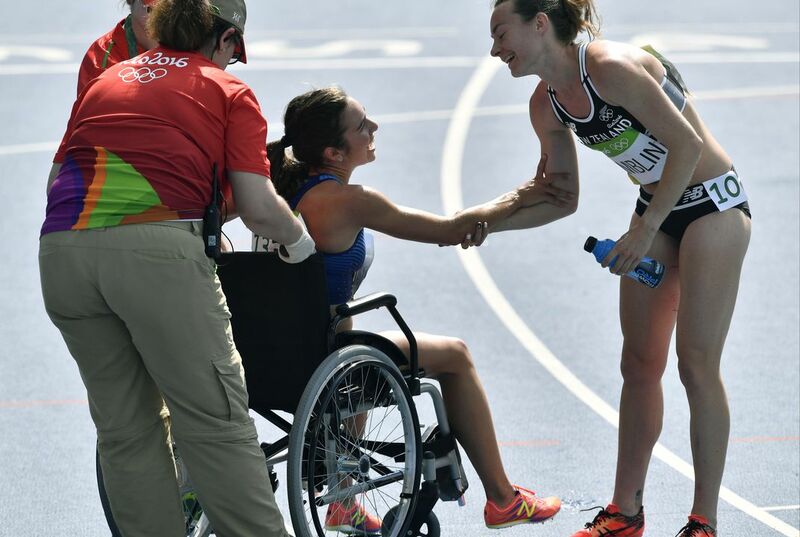 Hamblin and D'Agostino had provided a memory that captured the Olympic spirit. I believe that why they thought they lost is because they got lapped. Because the habim girl hurt her right foot. so d'agostion did not finish the finish line until habim finish.Then d'agostion finished the finish line.She also injurd her self now shes in a weel chair. Because they both fell and injured themselves which gave time for the other runners to get ahead. They were sure that they lost because they had both fallen and the completion was to god for them to make up for the time that they had lost. The girls were sure they had lost because one was injured. They had both been left behind by the other runners who were now faster than the injured girl. The other runner was now to far behind to catch up or win. To support my answer I gathered this from the text. "It started when D'Agostino clipped Hamblin from behind and they both went sprawling with about 2,000 meters to go." The girls were sure that they had lost because when she fell, she was already behind. When the other lady went to go and help her, she had lost too obviously. The race was over and neither of them had crossed the finish line yet. They were very supporting to each other and to them, that's all that mattered. The girls were sure they had lost because they both fell down. Injuring themselves while the others kept going, wasted a lot of time. They were automatically thinking that they lost. It would be hard to catch up with the others. The girls were sure that they had lost because Hamblin had fallen pretty bad, and D'Agostino decided to stop and help. As she was helping, all the other runners were getting way ahead. Then they realized there was no way they could win the race. But they at least had to make it to the finish line. And that was all that mattered. The girls were very supportive of each other. I know this because Abbey D'Agostino offered her help instead of winning the race. She even put her competitors needs before hers because she soon learned that she sprained her ankle. The girls were sure that they lost because they both fell at 2,000 meters and one of them stayed on the ground and crying because she thought that her chances of not finishing were slim. The other one hurt her ankle and still ran and helped the other woman up. They both finished the race that was a good thing because they worked together to finish." Hamblin fell heavily on her right shoulder, D'Agostino got up, but Hamblin was just lying there. She appeared to be crying. 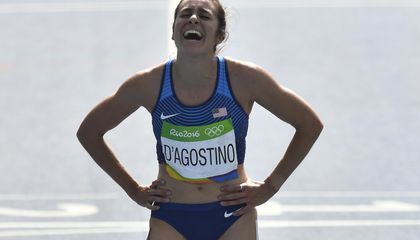 Instead of running in pursuit of the others, D'Agostino crouched down, put her hands under the New Zealander's shoulders to help her up, and softly urged her not to quit."